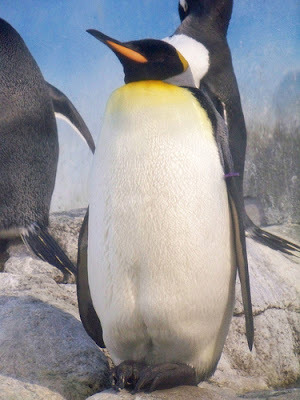 Skeptical Eye: Weekend Reflections: What's The Point of a Penguin? Weekend Reflections: What's The Point of a Penguin? I watch him jump from the rock and into the water to take a "dip". He flew, graceful and free, a water bird extraordinaire! Then he was underwater, and flying better than an old bird of the air. And I thought what's the point in being a penguin? The answer is simple: To be a penguin (and make more penguins; there's nothing else to it). Too many humans have yet to understand this. For it is the same with our species. The point of being a human is being a human (and sometimes, all too often, making more little humans). That's it. We want something more, however, and dream up outside forces called gods to give us a grander, more "meaningful" purpose. But there is nothing outside to impose such meaning on your life. Remember what you are, and live with it, for you have no other choice. You must do something while waiting for death, so why not just be human? Being human gives you many more options than are open to penguins, so give yourself your own purpose, your own point. You need (and have) no other.